Cupping therapy is an ancient and gentle form of massage therapy using suction cups to knead the muscles and fascia. It is estimated that through the earliest (surviving) written records we can date cupping therapy back to as far as 1550-3000 B.C amongst the ancient Egyptians. And since this time, it has continued to maintain its relevance and influence through the traditional and folk medicinal practices of communities as wide spread as Russia, Greece, Iran, China and France all the way into the present day clinical setting. Traditionally, cupping was applied through the use of flame inside a cup shaped vessel (made of either glass, clay or bamboo), so that by the use of the flame the air pressure inside the cup would dissipate creating a vacuum inside the cup where it could then be applied to the body as needed. This process has since continued to evolve to the present where we now use very durable and high quality cupping equipment; ranging from traditional glass cups to more modern innovations in the form of silicone and plastic cupping sets that are applied manually without the need for fire. Where massage and hands-on techniques seek to apply pressure directly into the tissue to illicit a positive effect; cupping lifts the skin, fascia and muscle fibres up, lightly stretching and lifting the superficial layers and drawing in circulation to the area. Here’s the wiki link for more information on the art of Cupping. Cupping works through pressure applied by suction to the surface of the skin. Which in turn lifts and pulls up nearby tissue into the cup. This pressure has the ability to draw in circulation to the area, whilst flushing out and drawing to the surface potentially stagnant blood and metabolic waste. Often when cups are placed proximally to each this pressure is felt to increase as more of the superficial fascial layers are brought into stretch by the addition of multiple points of lifting. Here’s a great link to , if you’d like a more in-depth explanation. When should I get cupping? If you have not had cupping previously, the best way to decide whether it is for you is to discuss it with your therapist. Depending on your needs and presenting issue, it may or may not be indicated for you, following an assessment and screening of your condition. The sensation produced by cupping is usually very acceptable, and pain free. A slight pressure is usually felt close to the skin, but is in no way discomforting. Your therapist will always adjust the pressure of the cups to suit your needs. Will I be left with a bruise after cupping therapy? Yes and no. Cups left on for up to 20 minutes will produce a mark of varying colouration, however contrary to popular belief this mark is not a bruise. And is usually not painful on touch. As opposed to bruising which is a form of internal trauma related to impact, the cupping mark is simply the drawing out of potentially stagnant blood/fluid from the tissue and surrounding muscle. When shouldn’t I have a cupping treatment? – If you have a recent surgical scar (less than 4 months old). – If you have a history of, or suffer from heart disease, circulation or DVT issues. What should I do after a cupping treatment? Similar to massage; it is recommended that you stay well hydrated for the remainder of the day drinking 2L+ of water, caution is also recommended in exposing cupping marks to direct sunlight for extended periods following treatment (such as yard work or going to the beach). As the skin near the marks will be extra sensitive to UV light. 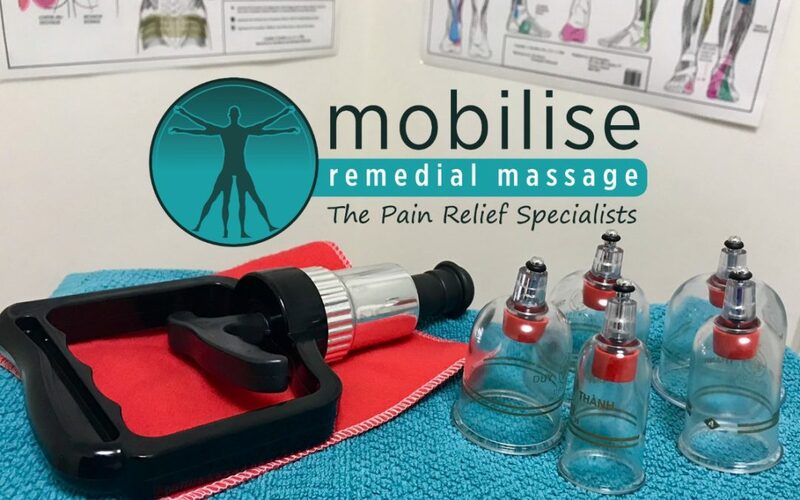 If you’d like to experience cupping therapy for yourself, contact one of our experienced therapists at Mobilise Remedial Massage in Brisbane or book online now!